The shape of the ring is smooth, oval, no sharp corners to get hung up on things when he is working. The repeating square pattern is bold on the top and tapers into a collapsing horizon down the shank of the ring, fusing into a single point. 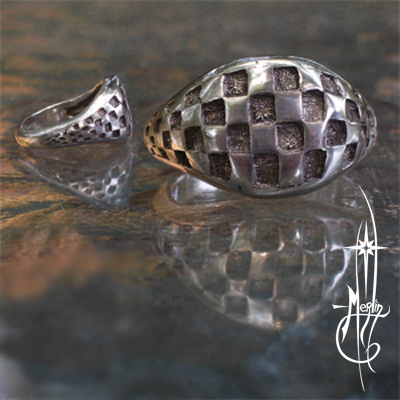 This is a one-of-a-kind Chessboard Ring, however if this design interests you, please email me to have one made for you. For more information about custom jewelry and sculpture, please visit my How to Order Custom Jewelry and Sculpture page.